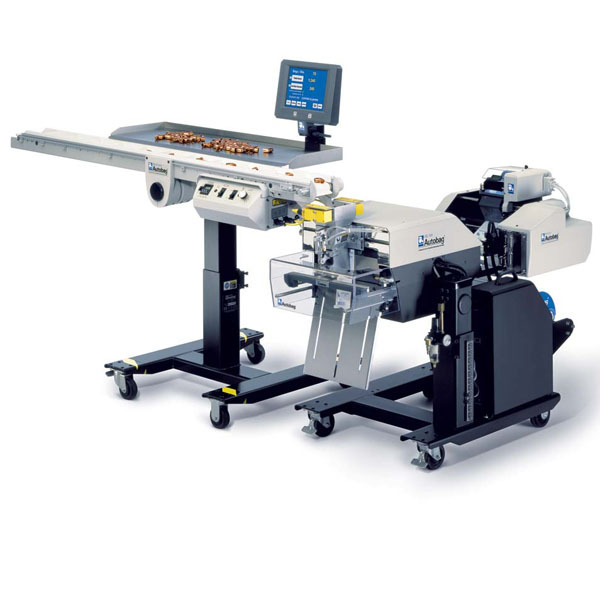 Capable of conveying and detecting hand load items at speeds up to 70 batches per minute, this controlled motion, flighted conveyor is designed to be simple to use, dependable and operationally flexible to double the productivity of hand load packaging applications. When used in conjunction with the Autobag AB 180™ bagging system, a bulk supply of product is placed on the product load tray, where an operator can retrieve the products and place them in the Maximizer flights. The conveyor then transports the product to an electronic field eye, which detects the product as it dispenses into a bagger mounted accumulating funnel. The product is then funneled into a pre-opened bag, at which time the bag is sealed and dispensed while another pre-opened bag is presented for loading. The Maximizer is fully adjustable to accommodate various parts and kit packaging requirements. Utilizing the very latest technology, the Autobag Maximizer conveyor is capable of detecting and counting product from 0.25" to 5.5" in length and up to 3" in width. It is ideal for small parts kit packaging applications.